Dustin Kensrue is probably best known as the former lead singer of Thrice, but is now worship director at Mars Hill Church in Seattle, and serving as Worship Pastor at Mars Hill Bellevue campus. His album The Water & The Blood was released at the end of September and is the latest release from Mars Hill Music, following earlier 2013 releases from Citizens and Ghost Ship. I got to chat to Dustin over Skype about the record in the week before it was released. SAM: I want to talk to you first about being in Thrice. What’s it like being a Christian in a secular band like that? DUSTIN: I guess backing up a little bit… Generally I don’t think we should have as much of a demarcation of Christian or secular bands. I think ideally we want Christians making great art, just as we want Christians doing great work in whatever field, whatever vocation God has called them in to. I think sometimes out of good motivation, good intentions, people feel like ‘I’m a Christian, so my art has to be explicitly about X, Y or Z – the Bible, Jesus or, whatever, but I think that’s not necessarily true, and hopefully I modelled that well with what I did with Thrice, in that I engaged with things that I really cared about deeply, and a lot of that ended up revolving around bigger questions of life – faith issues – and they would come out in various degrees of exposure, depending on what ever that song ended up calling for. But it wasn’t a Christian band, I wasn’t in a Christian marketplace separated from everything. So there’s lot of great interaction with people who disagree, who weren’t sure what they think about any of that. I think that’s a healthy dynamic. I think there’s a difference between having stuff that’s explicitly worship music, which is what I’m doing on this new record, so it has a different purpose in why it’s being made. It isn’t just to listen to and edify the listener, it’s further – can this be sung well? And is it clear enough? …And all these different things to be sung in corporate worship. SAM: Was it a big step to make that decision to leave Thrice to become this worship director at Mars Hill [Church, Bellevue]? DUSTIN: The two are not necessarily tied together. I was basically planning on stepping out anyway – just a lot of it with family issues, touring taking its toll, I had three little girls – two when I made the decision and another one on the way. It was just too much. So, I knew there was a different kind of stage coming. And at the same time God putting a different calling on my heart to really care about worship music, because I didn’t care at all about it. Actually I cared in the sense that really I didn’t like it, I didn’t want to have anything to do with it. SAM: My friend Mark is a big fan of Thrice and now, this stuff we’re hearing off this new album. He wanted to know whether you use different instruments and amps in Thrice to what you would on a Sunday at church? DUSTIN: I kinda use whatever works at the time, for whatever’s happening. I wouldn’t say that I have different sets of gear for different things it’s just kinda whatever I have at the moment that’s working and sounds like what I want it to sound like. SAM: The song Rejoice, it seems like a call to do so in the good times and the bad, what can you tell us about this song? DUSTIN: Yeah, it’s written as a big a call to worship – to worship God for what he is, for what he’s done for us, and even you see kind of throughout Scripture in various places, there’s a call to rejoice even in our sufferings. So I chose to flesh that out and take the listener or singer through that place of – how do I worship in the middle of sufferings? Looking at Jesus, seeing that he’s walked the path before us, that he’s walking with us even now, that he’s actually blessing us even in the suffering – because we know that he works all things together for the good of those who live him and called according to his purpose and… So I tried to tackle that without it feeling trite. And so it moves through a progression into that chorus where there is rejoicing in suffering and then rises out of that. So it’s hard to thread the needle through that but I think the song does a good job of it. SAM: The songs that you had written for this record, had they been around for a while? DUSTIN: Not really. Grace Alone had been around for a while, not sure how long – maybe a year. But as far as the other stuff, it’s all pretty new. I realised that I can’t write very well without… at least I can’t finish songs very well without a deadline. I’m just so used to writing to deadlines in recording. So once we set the dates for recording I was able to make more progress. Most of them are pretty new. SAM: What was the recording process like for this album? How long did it take and where did you do it all? DUSTIN: We did it mostly at our studio that we have. It’s in a building that we have a bunch of our central staff in – a lot of that’s changing. We have a studio in there that isn’t super pro-seeming if you walked into it. We don’t have a control room or anything. But we do have an amazing guy on our staff as our producer – his name is Brian Eichelberger – he’s been with the church for a long time. Super-talented guy and he leads really well in the studio in terms of where we’re trying to go with the songs and the records. He has a great ear for stuff so, that’s a huge part of the reason these records are so great. We recorded in there, and using a lot of volunteers from the church jumping in at different points. SAM: This album is described as a worship album and your role is worship director at Mars Hill. I’m keen to know why you and Mars Hill use that terminology when worship is a life thing. DUSTIN: Yeah. I mean, you can go back and forth on that all day… We’re definitely aware of the issues surrounding that. Bob Kauflin talks about that a bit – he has a great book Worship Matters. He kind of throws out like – yeah there’s an argument to be made for calling it this, calling it bla bla bla… but all the alternatives seem a bit forced. The truth is that, the one who is leading the music is leading worship. They aren’t the only person leading the worship. The next up the line – the pastors of the church are leading on a larger sense, the worship. Jesus, the top of that is the main worship leader. SAM: One of the standout tracks for me on the album as I listen through it is Suffering Servant. Clearly it’s written out of Isaiah. Is this an important passage to you? DUSTIN: Yeah. Very important. It’s one of my favourite portions of Scripture. I just wrote a blog about it. It’s amazing to see the detail with which Isaiah prophesies that what Jesus would come and do, what he would accomplish. He talks about that he would be the one who died for his people to save them. He talks about that he would die and also rise again. So a lot of amazing things, and a lot of smaller, incidental things as it talks about the fact he would be beaten beyond recognition. Different things like that. So I’m just amazed when I read it, and I think it’s helpful sometimes to see that and be like ‘Oh man, there’s no way I’m just reading this into the New Testament’. It’s like one of the most clearest gospel presentations 700 years before Jesus was even born. When you see constantly that the New Testament writers are referencing back to that Scripture as well. I love that Scripture. The point of the song was to take the Scripture, put it into a song, and not pull from a bunch of other places in Scripture. So it only pulls from Isaiah 52:13 through to Isaiah 53. It doesn’t reference [or] use the name Jesus, it only pulls from that section so it’s clearly praising Jesus for what he’s done but it’s only using that prophecy. So I think it’s cool to be able to sing that and go ‘Wow! That’s all in there, 700 years before.’ and worship in that. SAM: And it all points to Jesus. It’s really great. SAM: With the album only a few days away from release, what are you most looking forward to when it gets out there? DUSTIN: Man the main reason we’re doing what we’re doing is to serve the church. To serve Mars Hill Church and to serve other churches. So I’m excited for these songs to get out there and be played in churches, and encourage people, inform and transform people as they sing them, and that Christ would get all the glory in that and his people have joy in that. SAM: This album is full of congregational music. I’m keen to know though, do you play the songs differently in a congregational setting as to how it might sound on the record? DUSTIN: It depends on… so we have a bunch of different bands over fourteen locations. And as you can tell if you listen to Citizens’ release, or Ghost Ship – there’s different sounds to those bands. So we’re really trying to, even as we were before, trying to build a lot of unity within what we are doing at Mars Hill but not having uniformity. So that it doesn’t have to all sound exactly the same but we want to have a shared, almost hymnal, of the songs that we sing and ways that we sing them. So my band that I lead with on Sunday has different pieces… I have a woman who sings a lot of the time and plays viola as well – and there’s some strings on the record but not as much as what is featured on Sundays. There’s differences that we just adapt… There’s a trumpet on Rock of Ages and I don’t have a trumpet player.. So I guess I would probably play closest to the record […] and other bands would play it differently depending on what pieces they have or what building they’re in, what the people are like, where they’re at. Not trying to micro-contextualise, but also being aware that those things actually make a difference. Especially the building that you’re in makes a big difference – we have certain buildings that are older buildings that have crazy reverb and they’re next to houses so they can’t get too loud. It sounds crazy if they get too loud too quickly in there. The church that I lead at – the building that we have is a really deep room that’s really dead sounding. So if it’s not a big sound and a big band it doesn’t translate well in that room. It’s something that would work at our U-District doesn’t always work super well always. So there’s a lot of stuff like that. But we are conscious of some of the stuff on the records could seem like ‘Oh! We couldn’t do that at church’ or ‘we couldn’t pull that off’ and so we do have how-to videos showing the breakdown of the skeleton of the song. And this time, one of the videos is out there and we’re going to be releasing one every week after the record comes out that’s an acoustic band version of it – that’s just acoustic, bass, piano and drums – saying look, it’s stripped down showing you the bare bones of the song and you can kind of build it back up from there. So that should be helpful as well. SAM: That’s a great tool for churches all around the world, really. DUSTIN: Yeah. That’s definitely the goal with it. SAM: Is there a big idea to this album, or a key message you’re trying to get across? DUSTIN: There’s not a key message I’m trying to get across but the title of the record actually points a little to something I saw as it developed which is usually how I see things in the records that I write. Afterwards I start seeing that my brain was focusing on one thing or another. But, using The Water and the Blood, as a reference – these symbols… So the blood generally representing atonement in Scripture so, I saw that a lot – about half the record was more focused on this idea of atonement, of God’s grace, poured out on us through the cross. And then this other image, the symbol of water. Which often represents cleansing and that’s really the way that it’s used in Rock of Ages, but I see another large way that was more intriguing to me in the context of the record is it’s use of satisfaction. So, Jesus says ‘all you who are thirsty come to me’… ‘Drink the water I give you and never thirst again’… ‘Rivers of living water will flow out from within you’… So there’s this idea that only in Jesus can we find true satisfaction to these longings that we have as humans. So a lot of the record deals with that in various ways. Whether it’s It’s Not Enough which is saying ‘I have this longing and I can fill it’ or a song like Come Lord Jesus which is kind of pining for this ultimate fulfilling not only in the moment but in the future when Jesus will come back and make all things new and right. SAM: Do you have a favourite track on the record? DUSTIN: Man, I don’t know if I do. I like Suffering Servant a lot. I think it’s a really neat song and the way it turned out on the record I think is really great. I think It’s Not Enough is really great. I like Rejoice a lot, I think it’s a really solid congregational worship song. I got to work with Stuart Townend on that who has written some of the greatest modern hymns out there right now. So that was really cool. SAM: The clip for It’s Not Enough – I’ve got to ask you. Are you on a treadmill? DUSTIN: I am on a treadmill, yeah. SAM: Was it hard work? DUSTIN: Yeah, dude, it was real weird. It was really disorienting. It was dark, there was lights in my face, there was no handrails on it. So it was just really really disorienting. We switched the speed halfway through the song and I’m trying to perform it, also sing it, but I’m walking at four miles per hour which is really quick. So it was really weird. But I think it turned out pretty well. We don’t have a huge budget for that kind of stuff but we’ve got a great crew of dudes who are creative and able to pull stuff off on a shoestring. SAM: Whose idea was it for that kind of look? DUSTIN: Ah, it was my idea. The main point I wanted to get across with it was I wanted this locked-off shot of a performance towards the camera. There’s some cool videos that I’d seen where there’s an invasive intimacy that can be created in a shot that’s locked off like that. I wanted to force the viewer into dealing with the issue of the song. Just an added level of pushing it forward and encourage people to really deal with it and see how to play it out in their own minds. SAM: What can you tell us about that track, It’s Not Enough? DUSTIN: It’s based somewhat out of Ecclesiastes. Just this idea that it doesn’t matter what you try to fill yourself with, there’s an endless hole that you’re just gonna keep chucking stuff into. And it’s only able to be satisfied in Christ and that – it doesn’t get there in that song and I like that about it. That it has to be viewed in context with the rest of the record. I tried to do that with Thrice songs too. If they’re gonna go, sometimes I want to push to that place and leave you there and you gotta see it in context with some other stuff. So it really just goes there. But I like about it… I think sometimes what we do is this really simplistic thing, is like – all those things, those sinful things that you wanna do, they’re not going to fill you up. And by simply, being like ‘if you go cheat on your wife’, or ‘if you go drink too much’, or ‘if you go do drugs’. And that’s a really, I think, narrow look at what the issue actually is. So I try to really flesh it out and a lot of it is kinda looking at idolatry on a larger level. Pastor Mark [Driscoll] says idolatry is when we make a good thing a god thing. Like, your family, that can be an idol. It’s a good thing God gave you but you can end up worshipping it to your destruction and your family’s destruction. It goes through these things: learning, success, altruism, looking within yourself, looking without yourself. It moves through this and progressively gets darker. So right at the end, this idea of power starts creeping in there and destruction as another outlet of control. Just saying as dark as this goes, it’s never going to be enough. And this is where it’s leading to. SAM: The song Oh God is on the album – a cover of Zach Bolen’s song which was on the album Citizens. Why did you decide to do that song – I mean, it only came out a few months ago on their album. Why do your own version of that? DUSTIN: We had started playing it in [Mars Hill] Bellevue closer to the arrangement that I did on the record just out of necessity because the original version on the EP – it’s even lower than the one that he did on the record. And, it’s been one of the songs that we’ve sung the most in the past six months or so in church. It’s been a really helpful. So he – the funny thing is he wrote it kind of not even thinking about that way – more of a private worship thing. So he hadn’t even really been playing it. And I saw basically there was a sermon where I thought ‘that’d be really great’ but it’s not gonna fit with how we’re coming out of it. So I basically tried to make a different arrangement of it that was a little bigger and a little more joyful in this idea that once you hit the chorus – God is never leaving your side – and so it lifts a little more. It just worked really well. And so we ended up putting it on the record. SAM: The last track on the album It is Finished – is that a guitar at the start – it’s really frenetic, and what have you done to that instrument? DUSTIN: Yeah it’s a guitar. It’s got some funky stuff going on with it. I think some chorus… I dunno – I think it’s a lot of chorus (thinks) I dunno! SAM: I like it! It’s such a joyful finish to the record – it’s one of my favourite tracks anyway. DUSTIN: Thanks. Yeah, the record ends up moving… it goes in a couple of different arcs. So there’s like this beginning arc and then the middle arc is moving from It’s Not Enough – to this almost hopelessness into Come Lord Jesus which is ‘I’m longing for Jesus’ and then seeing in Oh God that he’s here with me now. And then moving to It is Finished which I think is the most joyful thing we can realise and one of the most important things is that Christ has accomplished everything on the cross. What I tried to really include in there is this idea that he’s won the war and therefore we’re able to go into battle bravely and… But also realising that it’s not ultimately dependant on us which is very freeing. SAM: Dustin thanks so much for talking with us today. I have loved getting my ears around this record and I can’t wait for others to do that as well. DUSTIN: Cool. Thanks so much man, appreciate your support. 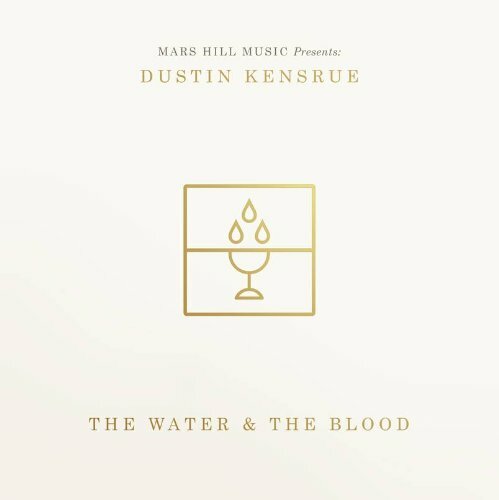 Dustin Kensrue’s The Water & The Blood is available now on iTunes. Physical copies can be purchased at http://smarturl.it/mhstore. Posted in MusicTagged christian, Christian music, Citizens, Dustin, Dustin Kensrue, Ghost Ship, gospel, Interview, It's Not Enough, Jesus, Mars Hill Church, Mars Hill Music, Music, Rock of Ages, The Water and the Blood, ThriceBookmark the permalink.